Make drying laundry easier with this premium quality multi-hanger/dryer from Hangerworld. 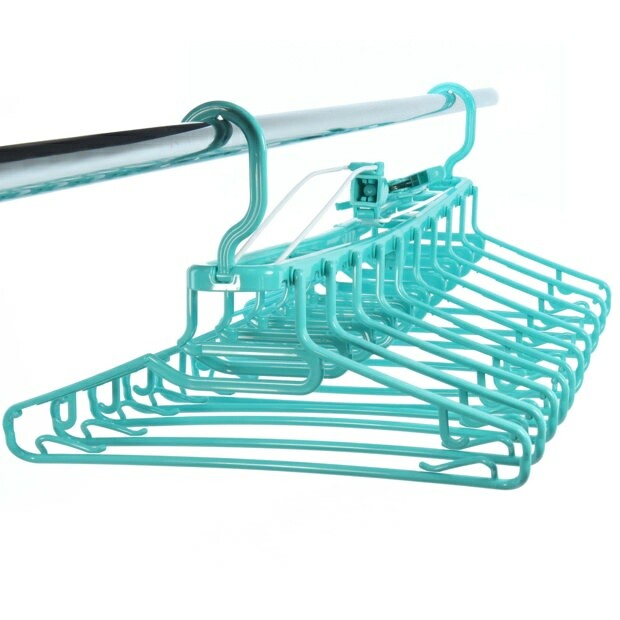 Plastic turquoise frame with 10 all purpose integrated clothes hangers for smart indoor and outdoor drying. Versatile central windproof hanging hook plus end hooks which allow full width or space saving drop down hanging. Clips easily to washing lines, towel rails, wall hooks, wardrobe doors and much more. Hang in drop-down position on the back of door for space saving storage. Clever easy load cut out neck for t-shirts. Side trouser grips and loop hooks make this perfect for trousers, skirts and dresses too. Smooth round edged hangers help keep clothes in shape whilst drying & storing. Neatly folds away after use. Perfect for caravanning, camping and travelling too. Size: Length x Height 87cm x 42.5cm (34" x 16.7") approx. Hanger Width: 38cm (15") approx.